I knew what he meant, probably better than he did himself. I think I knew that this would happen, or at least strongly suspected. I knew when we were so slow leaving the city. I knew from the way he had withdrawn into his cell phone, texting with his wife. When you throw something straight up in the air, there is a point where it has no movement at all. Before this point, it is rising, after this point it is falling. But for an instant, it is floating. This is the deadpoint. When climbing, you want your body at the deadpoint when grabbing a climbing hold. If you grab before the deadpoint, your own momentum will continue to carry you upward and off the hold. If you grab after the deadpoint, your downward momentum will put additional strain on your fingers, making it harder to hold on. If you grab exactly at the deadpoint, you will maximize your ability to hold on to small holds. The first rule of climbing is to climb on straight arms. The climber in the first picture is supporting his weight on his skeleton. In both pictures, the climbers are actively using the muscles that keep the fingers curled, but the first climber is using only those muscles, the second climber is using far more. Aside from the obvious bicep and latissimus dorsai muscles, the bent arm position in the second picture shows a climber stressing out the muscles in the forearm. It is this mistake, spending too much time on bent arms, that is responsible for the pumped feeling a new climber gets after a few climbs. There is a tendon system that runs down your arm and connects to your back. when you climb on straight arms, you hang on this tendon system. It is a holdover from our monkey ancestors that swung through the trees. Remember crossing the monkey bars as a kid? You swung from straight arm to straight arm. When you climb up, you want to use straight arms, too. Hold a book by the two fingers, one at the top of the binding, one at the bottom. If you hold the spine perfectly vertical, the pages splay out. If you tilt the book so the the top is no longer over the bottom, the whole book will rotate so the open pages are all pointed straight at the ground. In geometry, we learn that a triangle is defined by three points, and that a plane is also defined by three points. We can make a triangle out of our book example with one point on the top of the spine, one on the bottom of the spine, and one in the center of gravity. What we see is that the plane defined by these three points will always rotate itself to align perpendicular to the ground. The two fixed points act like the hinges on a poorly hung door. The door will always swing to point toward the center of the earth. This holds true for climbing. 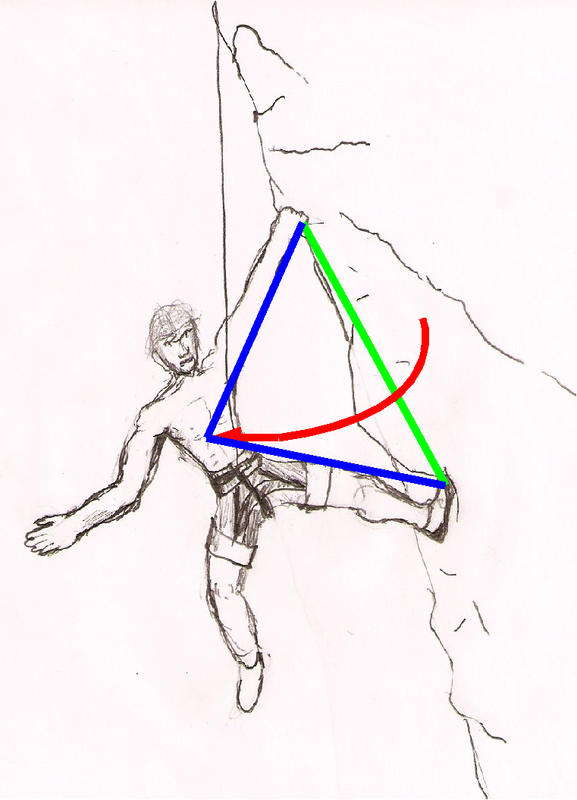 The simplest example is a climber holding on with both hands and no feet. The climber naturally dangles toward the ground. For people, the center of balance is typically the abdomen. Thus the triangle is formed by the two hands and the navel. In order to move smoothly, you are going to be holding on to the wall with only two points of contacts much of the time. In order to it is far more important that you align the triangle of you body with the ground. If you don’t you will be fighting your bodies tendency to rotate. One way that climbers do this is to only move one limb at a time while keeping three in contact with the wall. This limits your options significantly. The other way is to try and overuse the muscles of the forearm to battle the rotation, causing premature flame-out. 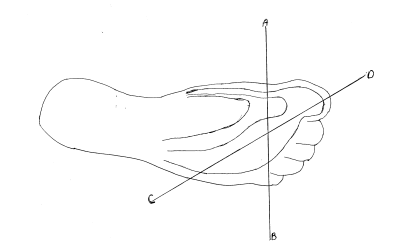 The longest line of the body if from hand to opposite side foot. This follows either the red or green line of the body. Note that where these two lines cross is near the center of balance. Let’s put together these items. The longest line of the body is from one foot to the opposite side hand, and this line crosses through the center of balance. We want to keep the center of balance in line with the contact points on the wall. This leads to body positions similar to the one displayed below. First and foremost, the climber is holding on with a straight left arm. This climbers body is in line from left hand, through abdomen, to right foot. His left foot and right arm counter balance each other to keep his body in line. If he finds his center of balance is off, he can adjust either limb to bring it back aligned. If he moves is right hand in or out along the dotted red line, his center of balance will adjust in or out parallel to that line. Additionally, he can move his hand in a circle and adjust his center of balance accordingly as well. His left leg follows the same rules. If he extends it out along the red dotted line,it pulls his center of gravity out along it. 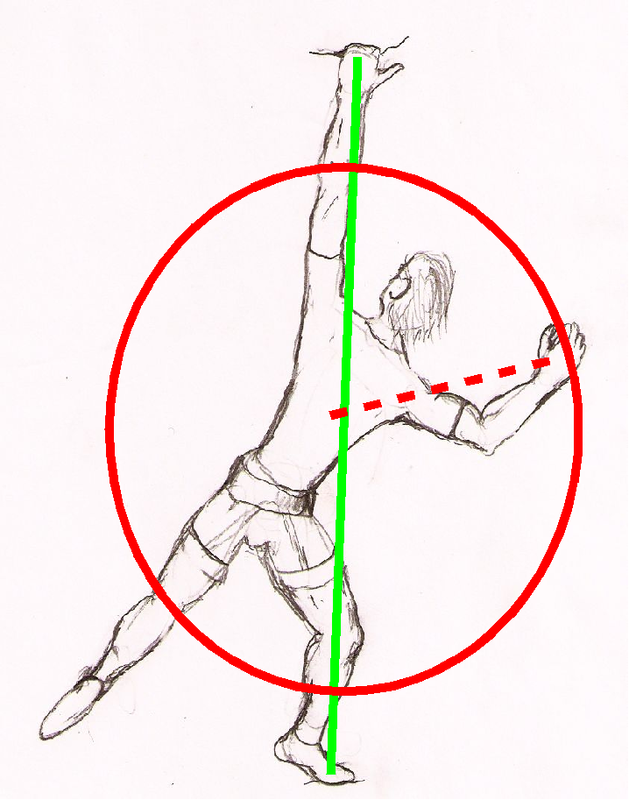 If he lowers his leg along the circle, he pulls his center of gravity in toward his body. The climber is leaning back against the side pull held by the left hand. He flags his left foot to provide a counter balance. 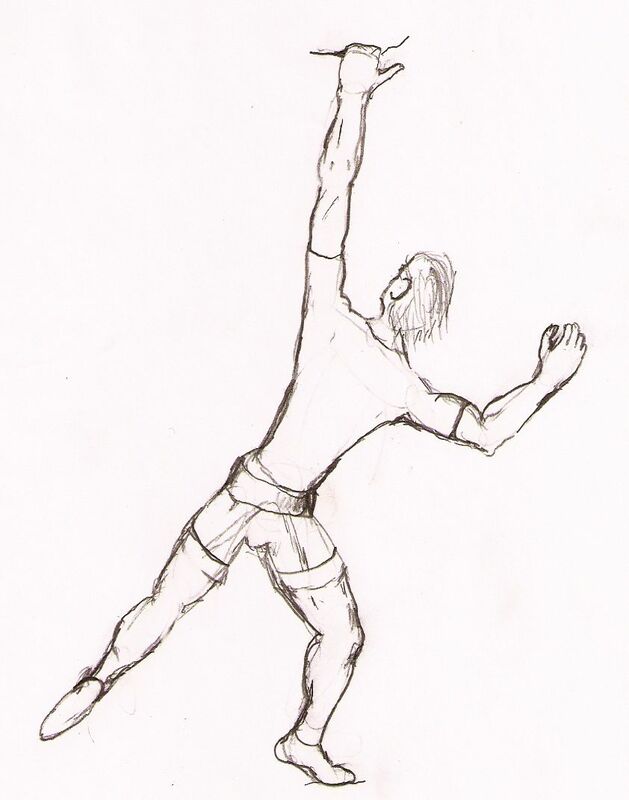 This moves his center of gravity toward the line between his right foot and his left hand. If he continues to torque around on this axis, he can push with his toe against the wall to provide a counter force. 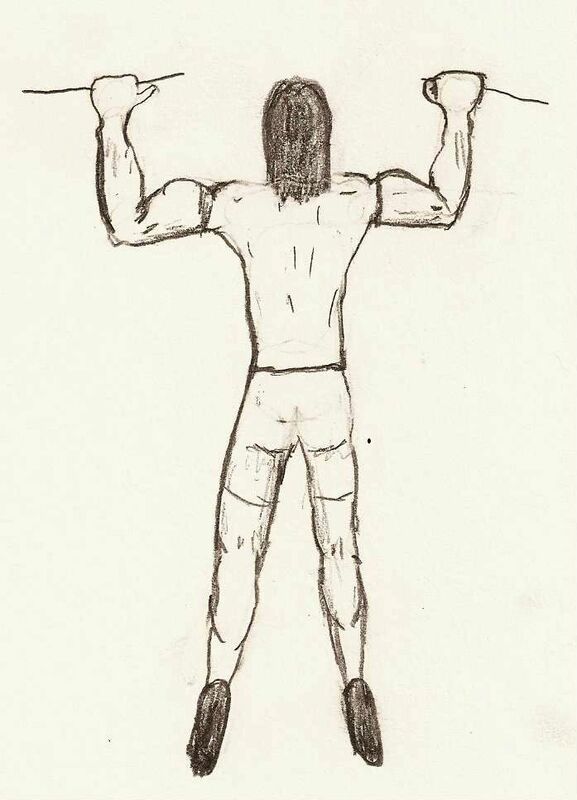 Once he grabs the hold with his right, he is likely to step through so his left hip is against the wall, standing on the outside of the left foot. This pattern of alternating the hip against the wall while reaching with the inside arm is a motion similar to swimming or salsa dancing. 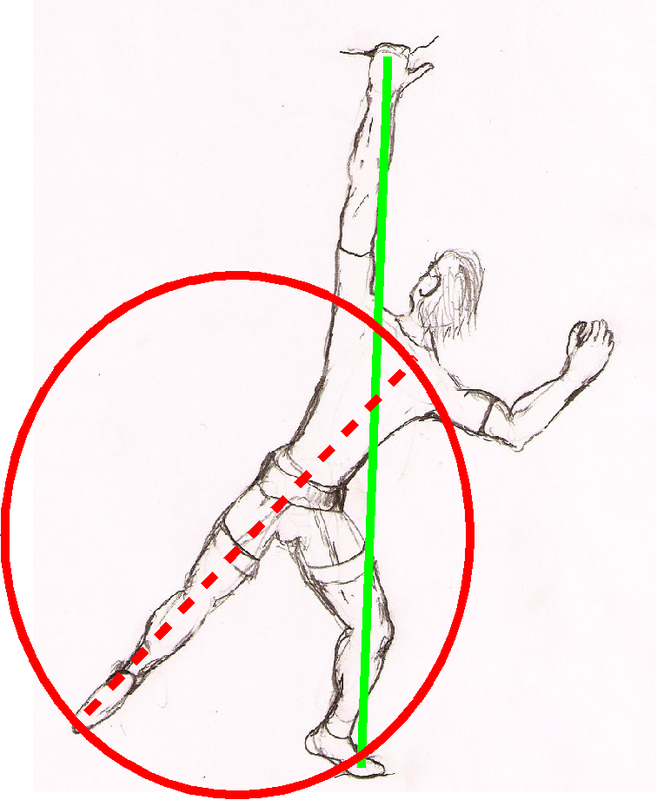 Here the green line shows the axis of the pivot, and the red arrow the movement of the swing. If you plan on climbing at Cannon cliff, try to find a climb other than Moby Grape. When you exit the parking lot at the base of Cannon Cliff, you will see a box on right hand side where you are expected to leave a record of your party, your vehicle, and your planned climb. Before I placed my sheet in the slot, I scanned through the 7 or so sheets from parties ahead of us. Two were planning on climbing Whitney-Gilman, one had listed a couple difficult climbs, and four were planning on climbing Moby Grape. The path to the cliff was different than I remembered from my last trip, back in 1993. After walking up and down the path a few times, looking for the cairn that was no longer there, I finally pulled out the guide book to see that we were supposed to hook a hard right on a small path right after the bridge. The hike up to the cliff comes up just to the right of the former site of the “Old Man of the Mountains.” The fog line was right at the base of the cliff, preventing us from really identifying any features on the cliff. Still, I knew that we were to the right of the start of Moby. So we walked left along the base of the cliff. Cannon really is a tremendous piece of granite. The frost action is brutal there, ;leading to lots of rock fall each year. That means that it has a lot of interesting features. Walking past many of the other climbs, you could see multiple lines up, corners, roofs, cracks, and aretes. 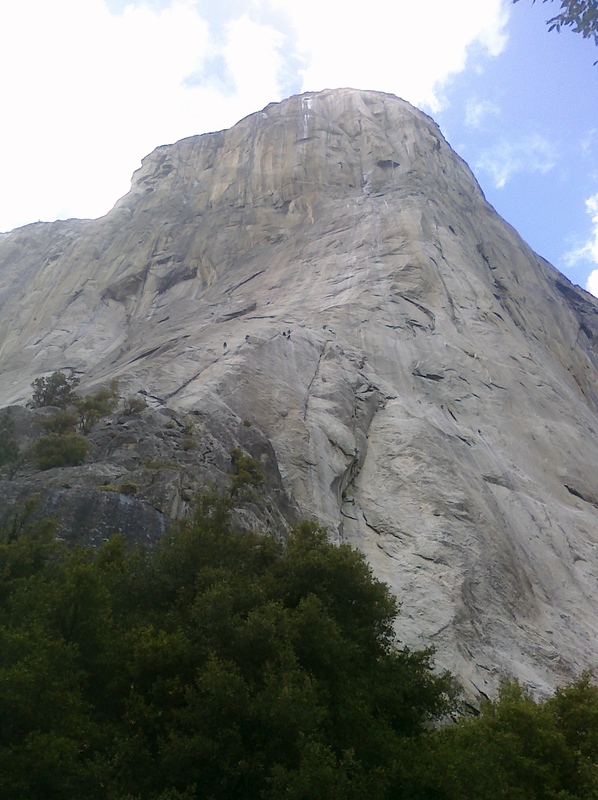 The first pitch of Moby Grape has been replaced by a better start, a single pitch climb. Reppy’s crack is a 5.8 hand crack that would feel right at home in Yosemite. When we arrived, there was a party on the climb, with the second just visible at the top of the crack, and another party all ready to go. We took our time getting prepped, as we would have to wait for both the leader and the second, but we were in no rush. Even though the climb is 8 pitches, only a couple go at 5.8 and most are easier. I did realize that I had forgotten my headlamp, and Pete admitted that he didn’t have his either. The leader of the party just starting the climb was a new leader, and had gotten scared recently, and did not know how to crack climb. He made about five feet of vertical progress in twenty minutes. We decided to move to a different climb. We decided not to do the original start of Moby as it took larger gear than we had brought, and the crowds up higher were likely to be as bad as we had there on the ground. Instead, we moved over to Vertigo, a 5.9 a few hundred feet back toward the trail. Actually, the first pitch was not Vertigo at all, but instead the first pitch of Union Jack. It was a clean, straight ahead 5.6 and Pete lead it with no trouble at all, setting up anchor a a pair of brand new bolts that would make the ASCA proud. The second pitch went at 5.8 and was mine. The first part was quite straight forward, interesting enough with a combo of crack and layback ending at a bolt. Yep, a bolt on Cannon. The bolt was there to let you lower out, and pendulum around the corner. I’ve done a little bit of aid climbing, and cheated on my share of climbs, but I don’t recall having to do a pendulum, and certainly not one as tricky as this. I had a goldlocks moment there: My first attempt was too high, my second was too low. My third was too high. But my fourth attempt was just right. I managed to grovel across the slab to the finger crack about 20 feet to my right and get up into the second part of the pitch. Due to the way the rope was running from the bolt, I had to run it out a bit before I could place another piece, but the crack was stellar, probably 5.7 climbing. I got stumped right before the anchor, and ended up hang-dogging the last move. It was a fairly physical sequence, and I was feeling pumped. The two climbers ahead of use were rappelling down, and I ended up hanging out at the anchor with one of them. Between their tale of the offwidth and the fact that I was freezing made me decided I did not want to complete the climb. IT was Only 5.9, but I am pretty out of shape, my partner wasn’t going to lead it, and I was close to fried. Instead, we rappelled one long 200′ rap to the ground and moved over to Slow and Easy. This is a 5.8 crack on the left edge of the big wall area. Pete gave it a quick attempt, but was shut down by the unfamiliar climbing style. I gave it a go, and, although challenged by it, lead it clean. I love crack climbing, in case you were wondering. On the hike out, we walked down directly beneath the former site of the old man. I turned and looked up ward and saw, silhouetted against the sky two cables. They looked like wipers that had been left up while someone cleaned the windshield. I wondered which of the boulders we scrambled across had been part of New Hampshire’s icon. I was looking at a course for climbing guides and it said you needed a climbing resume. I decided I would try to list all of the climbs I had ever done. Here it is. It is not complete. If you’ve done a route with me and it does not appear here, please let me know. There are two main forms of rock climbing. The most popular is face climbing. The climber makes upward progress for the most by pulling downward on small ledges in the rock with their hands, and stepping on top of these same ledges with their feet. This is the predominant style of climb in climbing gyms as well as sport climbing. The other form of climbing involves cracks in the face of the rock. The techniques involved in navigating a vertical crack in a rock are somewhat different from the more popular face climbing. I love crack climbing. A crack in the rock about two inches wide, just wide enough to get my hand inside, is thus called a hand crack. If a crack is in the face of a rock, with both sides of the crack flush, it is called a splitter crack. My ideal climb involves serious portions of perfect splitter hand crack. A lot has been written about the placement of hands in hand crack. Less has been written about foot placement. 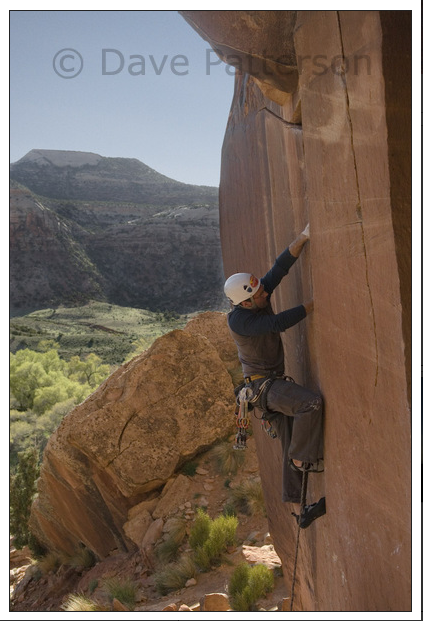 Many people avoid crack climbing due to the painful nature of foot placement in cracks. I suspect I know the reason, and have a technique that will help both minimize the discomfort and maximize the effectiveness of foot placements. The advice most people get when learning how to place feet is to cam the knee out perpendicular to the crack, so that the sole of the foot is vertical. You place the foot into the crack, and then turn the knee vertical, camming the foot inside the crack. The discomfort most people feet comes from the focus of pressure on the high point behind the big toe. The diagram above is a simplified contour map of the foot. The curved paths represent spots on the top of the foot that are all the same height. The line segment AB represent the edge of the crack when the foot is placed parallel to the ground and perpendicular to the crack. Note how this line goes right over the arch behind the big toe. This is the pain point. Proper foot placement in crack climbing is based around lining up the contour of the foot with the edge of the crack. The line Segment CD represents the edge of the crack in the preferred approach. Note how it aligns more closely with the major contour that runs along the outside edge of the foot, behind where the toes join. A typical climbing shoe, especially one designed for crack climbing, will have sticky rubber well up to this point. This sticky rubber is much more evenly in contact with the sides of the crack. Here’s the technique. Rotate the knee out to the side so your foot is vertical. Place your vertical sole in the crack. You should just feel the edge of the crack on the pain point. You are going to use the pain point as the pivot point as you rotate the heel of the foot downward while you straighten your leg. Your foot will cam naturally into the crack, and the pressure will be distributed along the contour line of the top of the foot. As you rotate your foot, straighten your leg as well, and you should be able to place body weight on the newly placed foot. Dave Patterson’s photo shows Joe Dawson with his left leg in the described position. (Yes, that is Indian Creek, home of some of the greatest splitter cracks you can imagine.) 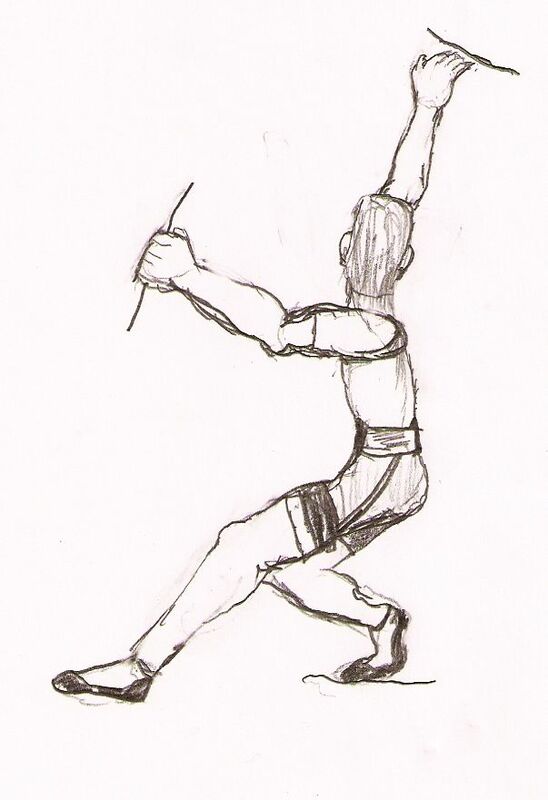 Note that he has his fully body weight on the lower leg, minus the small bit that is loaded on his arms. Note: Dave is a friend. I got explicit permission to use his photo. Please do not take it and use elsewhere.